Halloween Comes Early - Connecticut Horror Fest Report! 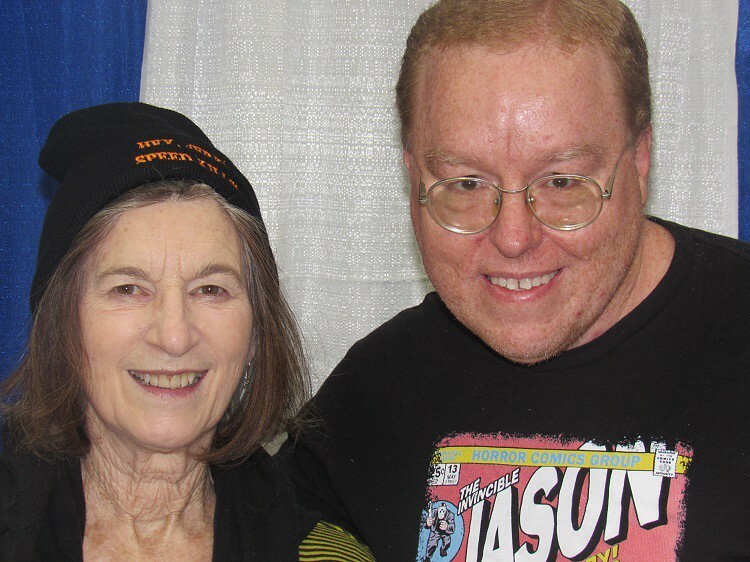 Made my way up to Danbury, CT for the CT Horror Fest, with my prime (and it turns out only) want being Nancy Kyes, AKA Nancy Loomis, from the original 1978 Halloween film. Although she's started to take more bookings this year, Nancy has been extremely rare to come to the Northeast recently, so she's one of only a handful of living 78 Halloween people I still need. When I looked on a map, I presumed that the convention was going to be held in the college arena that ECW used to run at in the early 2000's. 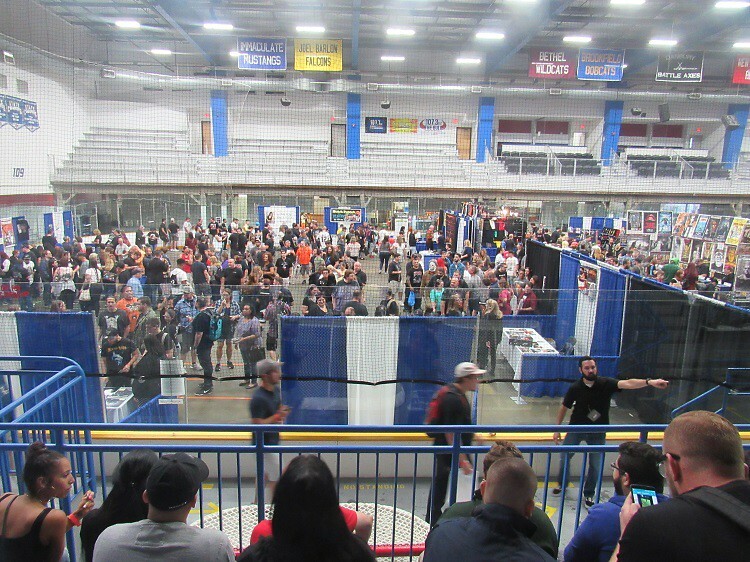 However, when we pull up, it's actually at a much smaller nearby ice arena, that looks more like somewhere ECW would have ran in 1995 for a house show. What's even more surprising is that despite having a small guest list that only included Pam Grier and (mostly) common 80's horror guests, the place was pretty much packed. Nancy Loomis and Nick Castle even had to have their overflow lines taken up to the hockey bleachers while the staff waited for their lines to thin out. Never would have expected a turnout like this for a horror-centric small con. 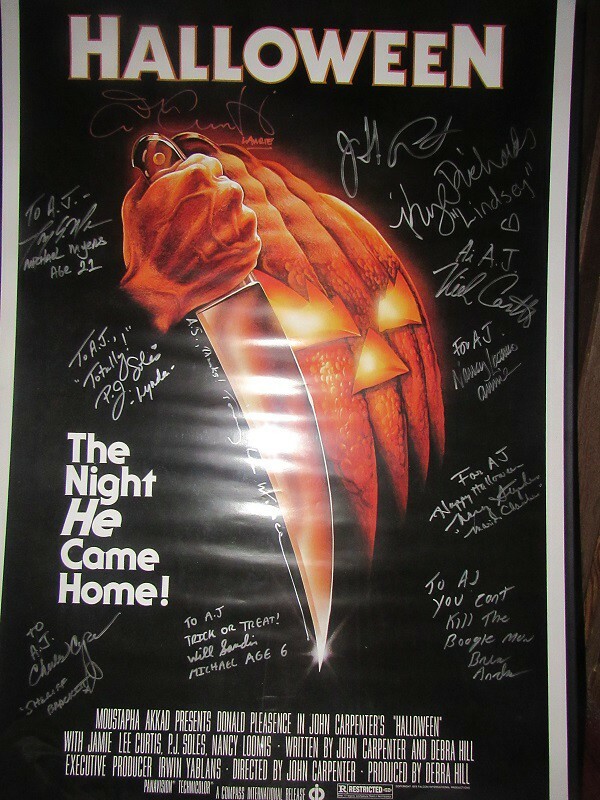 I finally get up to Nancy Loomis' table, and get her on my 78 Halloween poster (The 12th sig on it) and a Japanese press book. She was very friendly, spending time to talk to every fan. Was considering getting 8x10s of the other Halloween guests (that I've met before), but lines and prices made that an easy pass. So all in all, a relatively short 1.5 hour drive to get a significant want off my list was a fine day to spend a Saturday afternoon. Waiting on line...to get on line. Does that mean you won't be coming to Monstermania Hunt Valley? That crowd truly is shocking for that con! The only way I was going to Hunt Valley was if Loomis cancelled this show, or if new guests I need got booked. So barring late additions, I will not be there. LOL, I was there today for 15 minutes. How much do these horror convention guests make per appearance? I know nobody has specific numbers but is it similar to wrestling where you can get the likes of Nancy Loomis to come in for a signing for 500 bucks and a hotel room? If so, that crowd is really impressive. If you assume they managed 1000 people for the day (Just assuming) and each person pays a 30 dollar entry fee that's a 30,000 dollar gate and likely only 10,000 or so going into the talent and maybe 1000-2000 into the venue (If that). Throw in 3000 for advertising and that's a profit of 15,000 off entry tickets alone plus the autographs/photos plus the tables etc etc. Nice meet by the way. I always find it cool to read about the smaller conventions. Alex Vincent had a good line, as did Nick Castle, both of who are very Virgil. This is a fairly established horror con at this point. And we all know the horror fans of the big 3 (Freddy, Jason, and Mike) like to get stuff signed. Also many don't travel for cons. Though Pam, Gains, Butch, and the children of the corn guy had little to no line. The poor kid from Blair Witch Project was doing so little business, I actually felt sorry for him - especially since his table was facing Castle, Loomis, PJ Soles, etc, and was next to Bill Moselely. He had to sit there juggling his sharpies alone while watching literally everybody in his immediate area doing business the whole time.